A dark, still figure, wearing long black robes and a hood, appears on the charming village green of Three Pines, a small Québec town; though at first it seems scary but harmless, it turns out to be something much more sinister. The strange figure’s appearance coincides with a Halloween party at the local bistro, attended by the usual villagers but also four out-of-town guests. They are friends from the Université de Montréal who meet for a yearly reunion at the B&B in Three Pines. But this event actually happened months ago, and village resident Armand Gamache, now head of the Sûreté du Québec, is recounting the story from the witness stand in a courtroom suffering from oppressive summer heat. Gamache’s testimony becomes narrative, explaining how over the course of a few days the masked man grew into a fixture on the village green and morphed slowly into an omen. Gamache’s son-in-law and second-in-command, Jean-Guy Beauvoir, is asked to research the “dark thing’s” back story after one of the B&B guests, a journalist, mentions that the figure reminds him of story he did on an old Spanish tradition, that of the “debt collector.” It becomes clear, as Gamache relays the events leading up to murder, that “someone in the village had done something so horrific that a Conscience had been called.” But did the dark thing come for a villager or for one of their guests? Conscience is an overarching theme in Penny’s latest, seeping into the courtroom narrative as Gamache grapples with an enemy much larger than the dark thing, a war he took on as the new Chief Superintendent. His victory depends on the outcome, and the path, of this murder trial. 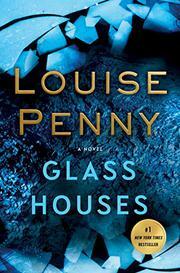 While certain installments in Penny’s bestselling series take Gamache and his team to the far reaches of Québec, others build their tension not with a chase but instead in the act of keeping still—this is one such book. The tension has never been greater, and Gamache has sat for months waiting, and waiting, to act, with Conscience watching close by. A meticulously built mystery that follows a careful ascent toward a breaking point that will leave you breathless. It’s Three Pines as you have never seen it before.